There is nothing to prevent anyone from indulging in experimenting with wine and food: from classic recipes that you know well to more unusual recipes that, perhaps, do not belong to the culinary traditions of your country. 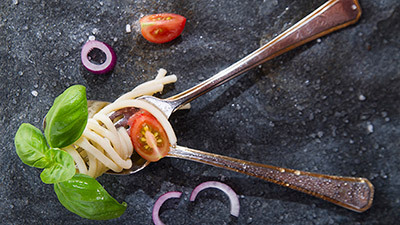 Below we suggest 3 delicious and very tasty Russian recipes that can go very well with our Tuscan wines: Chianti Classico Riserva, Torre di Montemaggio IGT e Chardonnay di Montemaggio IGT. Scarica le 3 ricette in Italiano (Download the recipes in Italian). Scarica la ricetta in Italiano (Download the recipe in Italian). 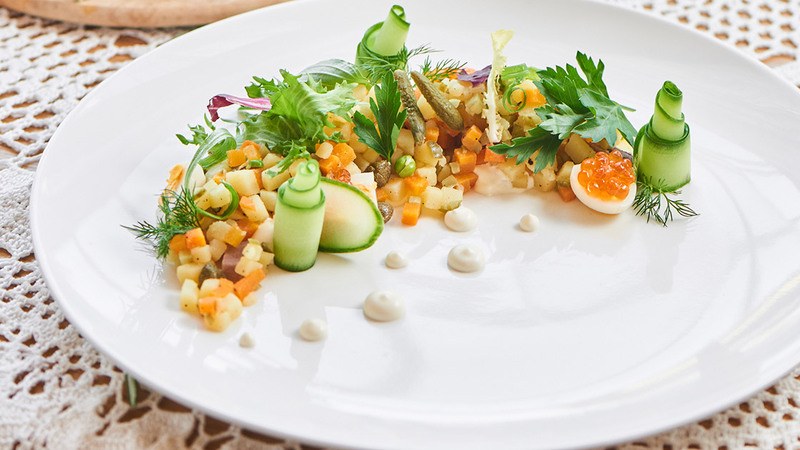 Salad Olivier is a typical Russian dish that is usually prepared during special occasions. According to several sources, the original version of the salad was invented by a cool of Belgian origin, Liciene Olivier in 1860s. The best recipe consists of potatoes, salty cucumbers, peas, onion, carrots, boiled eggs, and you can also add some sort of protein. The best option is either shrimps or quails, but it could be done even without any protein or with other proteins of your choice. Steam potatoes and carrots in skin (it helps to keep vitamins), then cool them down and peel them. Boil eggs and boil meat (any meat or shrimps) or roast quails. Chop potatoes, carrots, eggs, meat/fish, dill pickles into small squares. Add green peas and salt. Trust your own taste, everything must be in proportion. Stir mayonnaise in, you can also mix in some sour cream or even natural yogurt if the taste of the mayo is too rich. Mix the salad and refrigerate for a while. The longer the salad it states in the fridge the better taste will be. The best to leave it overnight. Depending if you decide to use quails as a protein, then the meat should be taken off from the bones by hands and put into the salad. The quails breast is the best part to be used for this recipe. Manti is a typical Kazakistan recipe that is very popular in Central Asia and Russia. 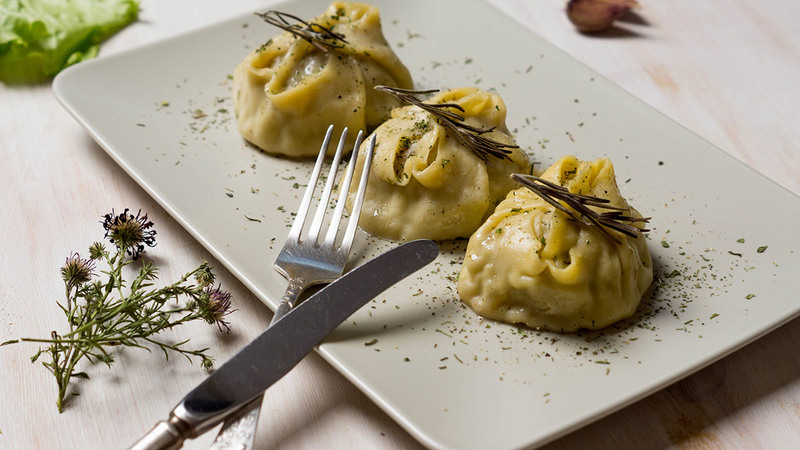 Manti are made with pasta for dumplings and filled with minced meat, seasoned with spices and onions. They are then steamed in Asian bamboo steaming basket, and generally served with sour cream. Mix and knead egg, flour, some salt and enough water to form an elastic, not sticky dough. Let rest for 1 hour. Mix meat, onion slices, salt and pepper and knead with your hands (the juices released from the onions make the filling tasty and juicy). Roll out dough, not too thin. Use a large round cookie cutter, glass or small bowl (about 3-4 inches diameter) to make rounds. Scraps can be re-rolled. Mount a spoon of filling in the center of each round. Dot each with a little butter. Fold two opposite sides up and pinch to seal. Pinch open ends to seal, then pull around and pinch ends to form a round dumpling. Spray steaming baskets with non-stick spray (or simply oil), place Manti, spacing apart so they don’t touch, in baskets and steam for about 30-40 minutes. Pile Manti on platter, dotting with butter so they don’t stick together. Serve with generous amount of sour cream. The making of the Manti is quite time consuming, in Russia the whole family pitches in. Unfortunately, due to the large amount of onions in the filling, they don’t freeze well. Shashlik is a very important food and specialty of the Slavic people, but it’s not just limited to beef or lamb. Also pork, chicken and even vegetables could be used as well. Combine all of your marinade ingredients in a large plastic or glass bowl (do not use aluminium) and stir to combine. Slice meat and transfer it into the marinade bowl, stirring well to coat. Marinate beef in the refrigerator 4 to 6 hours, stirring a few times while marinating to make sure meat is evenly marinated. Sometimes after long periods of refrigeration, the oil in the marinade can firm up a bit; it will liquefy again if you let the marinated meat sit at room temperature 30 minutes before skewering. Soak bamboo or wooden skewers in water at least 30 minutes before skewering. After the meat is done marinating, slice veggies and skewer them with meat onto Bamboo skewers. Brush/pour remaining marinade over skewers. Grill steak kabobs over medium-high heat for about 8-10 minutes or until you’ve reached the desired doneness, rotating every 2-3 minutes for even grilling. 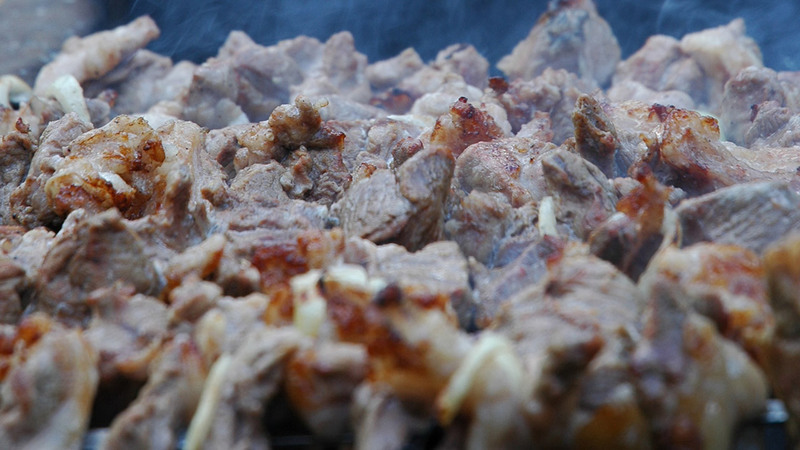 Remove kabobs from grill and let them rest at least 5 minutes before eating. If you cut into them right away, they will juice out and end up dry. Beef skewers are a little tricky to master. The key is to give your meat plenty of time to marinate and don’t rush it! I like to marinate for at least 4 to 6 hours. Using bamboo or wood skewers is best. The heat from a metal skewer can start cooking your meat from the inside, ruining that juicy pinkness that you might desire. Soak your wooden skewers in water at least 30 minutes so they don’t scorch or burn completely on the grill. Don’t crowd your skewers. You want a little space between your meat and vegetables so your food grills on all sides.